Fellowship of International Max Planck Research School (IMPRS) for Ph. D.
a) How plants sense insect attack rapidly? b) Which early signaling genes are involved in herbivory-induced signal transduction, and how do they function? Functional analysis of candidate genes, their crosstalk with downstream phytohormone and secondary metabolite signaling pathways. Identify common, conserved defense pathways upon insect perception in monocot and dicot plants and study how specificity is maintained. c) What makes an intelligent plant: How plants activate systemic signaling upon herbivory? Key to the success of plant defense against voraciously feeding insects are the need for local and systemic communication between cells. Plants possess a rapid systemic stress signaling system in the absence of a central nervous system as in animals. Changes in electrical signal, membrane potential, and Ca2+ are possible causes of systemic signaling in herbivory. Molecular components involved in production systemic signals, the factor that moves from leaf to leaf and decoding mechanisms are our areas of interest. Research objective: To understand the molecular mechanism by which plants defend themselves against wide array of insect herbivores, and to use this knowledge in developing insect control strategies. We use forward and reverse genetics approach, biochemical /analytical techniques, and imaging to expedite novel discoveries in plant defense against insect herbivory. a) How is the microbial symbiont recognized by roots of different plant species? b) How is the plant perception of microbial symbionts different from pathogens? b) Which are the key fungal genes involved in the successful plant root colonization, and how do they execute their functions? d) Does the microbial symbiont provide systemic resistance against insect herbivory? Research objective: To understand the molecular mechanisms by which symbiotic fungi in roots provide growth advantage to whole plants and utilize the knowledge to develop novel strategies to improve crop yields. Dr. Balu obtained his PhD from MKU, Madurai. He has done his postdoctoral studies in UC-LA, USA and University of Regensburg, Germany. He is currently working on the structure determination of membrane proteins involved in calcium signalling. Dr. Abhimanyu Jogawat obtained his M.Sc. and PhD from SLS, JNU, New Delhi. He is currently SERB, national postdoctoral fellow working on the role of calcium signaling in Piriformospora indica and Arabidopsis mutualism. Pritha Kundu has submitted her PhD thesis from IISER Kolkata. Currently she is working on "Understanding the role of calcium ion channels in plant defense against Spodoptera litura herbivory". 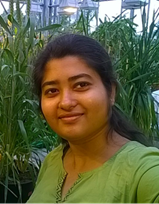 Ms. Deepika Mitta did her M.Tech in Biotechnology from VIT University, Vellore and is currently a PhD student working on identification of novel calcium regulated jasmonate perception modules in Arabidopsis. 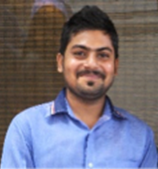 Mr. Ramgopal Prajapati did his MSc from University of Lucknow and is currently a PhD student working on role of calcium signaling in plant defense against herbivory. Mr. Vinod Kumar Prajapati obtained his M.Sc. in Molecular Biology and Biotechnology from Tezpur University, Assam. He is a PhD student working on identification of effector proteins secreted by Spodoptera litura and their role in plant defense manipulation. 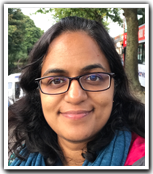 Ms. Deepthi Krishna did her MSc from IISER, Mohali and is currently a JRF working on Max Planck-India partner group project. Ms. Shruthi Mishra did her MSc from University of Hyderabad and is currently a JRF working on Max Planck-India partner group project. 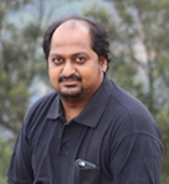 Mahendra is a bioinformatician and works on in silico identification of effector proteins in Spodoptera using NGS. 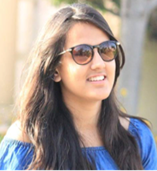 Ms. Riya Joon did her MSc from TERI University and is currently a JRF working on generating mutants with calcium reporters. Pradeep is our lab attendant and takes care of insect rearing. Dr. Mukesh Kumar Meena did his PhD from NIPGR. He is currently working as a postdoc on role of CNGCs in Arabidopsis defense against insects. Dr.Anish Kundu did his PhD from IIT, Kharagpur and a postdoctoral study at University of Saskatchewan, Canada. He is currently working on metabolomic and biochemical defense responses of plant during plant-insect interactions. Highly motivated researchers who would like to join the lab are welcome to contact the PI for masters research, research associate or senior research fellow positions. Kundu, A., Mishra, S. & Vadassery, J (2018).Spodoptera litura-mediated chemical defense is differentially modulated in older and younger systemic leaves of Solanum lycopersicum. Planta doi: 10.1007/s00425-018-2953-3. Kundu A, Vadassery J (2018) Chlorogenic acid-mediated chemical defense of plants against insect herbivores. Plant Biology (Stuttg). doi: 10.1111/plb.12947. Jogawat A, Vadassery J, Verma N, Oelmüller R, Dua M, Nevo E, Johri AK (2016) PiHOG1, a stress regulator MAP kinase from the root endophyte fungus Piriformospora indica, confers salinity stress tolerance in rice plants. Sci. Rep. 6, 36765; doi: 10.1038/ srep36765. Scholz SS, Reichelt M, Vadassery J, Mithöfer A. (2015) Calmodulin-like protein CML37 is a positive regulator of ABA during drought stress in Arabidopsis. Plant Signal Behav. 2015;10(6):e1011951. Kiep V, Vadassery J, Lattke J, Maaß JP, Pieter E, Boland W, Mithöfer A (2015) Systemic cytosolic Ca2+ elevation is activated upon wounding and herbivory in Arabidopsis. New Phytologist doi: 10.1111/nph.13493. Scholz SS, Reichelt M, Vadassery J, Mithöfer A (2015) Calmodulin-like protein CML37 is a positive regulator of ABA during drought stress in Arabidopsis. Plant Signaling and Behaviour 10(6): e1011951. doi: 10.1080/15592324.2015.1011951..
Jisha V, Dampanaboina L, Vadassery J, Mithöfer A, Kappara S, Ramanan R (2015) Overexpression of an AP2/ERF type transcription factor OsEREBP1 confers biotic and abiotic stress tolerance in rice. PLoS One 10(6): e0127831. Meena MK, Vadassery J (2015) Channels hold the key: cyclic nucleotide gated channels (CNGC) in plant biotic stress signaling. Endocytobiosis & Cell Research 26: 25-30. Vadassery J,* Reichelt M, Jimenez-Aleman GH, Boland W, Mithöfer A (2014) Neomycin inhibition of (+)-7-iso-jasmonoyl-L-isoleucine accumulation and signaling. Journal of Chemical Ecology doi:10.1007/s10886-014-0448-7. (*Co−corresponding author). Michal Johnson J, Reichelt M, Vadassery J, Gershenzon J, Oelmüller R (2014) An Arabidopsis mutant impaired in intracellular calcium elevation is sensitive to biotic and abiotic stress. BMC Plant Biology 14: 162. Scholz S, Vadassery J, Heyer M, Reichelt M, Bender K, Snedden W, Boland W, Mithöfer A (2014) Mutation of the Arabidopsis Calmodulin-like protein CML37 deregulates the jasmonate pathway and enhances susceptibility to herbivory. Molecular Plant. doi:10.1093/mp/ssu102. Vadassery J, Reichelt M, Hause B, Gerzhenzon J, Boland W, Mithöfer A (2012) CML42 mediated calcium signaling regulates plant defense against Spodoptera herbivory and multiple stress in Arabidopsis. Plant Physiology 159: 1159-1175. Vadassery J, Reichelt M, Boland W, Mithöfer A (2012) Direct proof of ingested food regurgitation by Spodoptera littoralis caterpillars during feeding on plants. Journal of Chemical Ecology 38: 865-872. Yilamujiang A, Vadassery J, Boland W, Mithöfer A (2012) Calmodulin-like proteins, CMLs: New players in plant defense regulation. Endocytobiosis & Cell Research 22: 66-69. Vadassery J, Ranf S, Drzewiecki C, Mithöfer A, Mazars C, Scheel D, Lee J, Oelmüller R (2009) A cell wall extract from the endophytic fungus Piriformospora indica promotes growth of Arabidopsis seedlings and induces intracellular calcium elevation in roots. The Plant Journal. 59(2): 193-206. Vadassery J and Olemuller R (2009) Calcium signaling in pathogenic and beneficial plant microbe interactions: What we can learn from Piriformospora indica and Arabidopsis thaliana. Plant Signalling and Behaviour4(11): 1-4. Vadassery J, Tripathi S, Prasad R, Verma A, Oelmüller R (2009) Ascorbate, monodehydroascorbate reductase3 and 2 are crucial for the mutualistic interaction between Piriformospora indica and Arabidopsis. J Plant Physiol. 166(12): 1263-1274. Vadassery J, Ritter C, Venus Y, Camehl I, Varma A, Shahollari B, Novák O, Strnad M, Ludwig-Müller J, Oelmüller R (2008) The role of auxins and cytokinins in the mutualistic interaction between the Arabidopsis and Piriformospora indica. Mol. Plant Microb. Interact. 21(10): 1371-1383. Jyothilakshmi V, Singh A, Gaikwad K, Vinod K, Singh NK and SMS Tomar (2008) RNA editing in CMS wheat: Influence of nuclear background leads to differential editing on orf256. Indian J. Genet. 68(4): 353-359. Shahollari B, Vadassery J, Varma A, Oelmüller R (2007) A leucine-rich repeat protein is required for growth promotion and enhanced seed production mediated by the endophytic fungus Piriformospora indica in Arabidopsis thaliana. 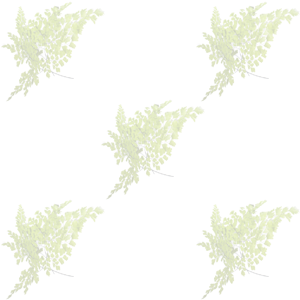 The Plant Journal 50(1): 1-13.